Menton Daily Photo: Lucky black cats? If a black cat crossing your path means bad luck, do two mean good luck?! Si un chat noir traverse votre chemin c'est un signe de malchance, s'il y en a deux c'est une bonne chance ?! What a beautiful photo. Absolutely adorable! They're beautiful. Among our many cats in our family was a black cat that was a very gentle, sensitive soul. Beautiful photos Jilly. I have 2 black cats and they are smarter and more sensitive than any other cats I've ever owned--I also have an orange cat I took in when his owner died. Why not? If you multiply two negative numbers you get a positive. 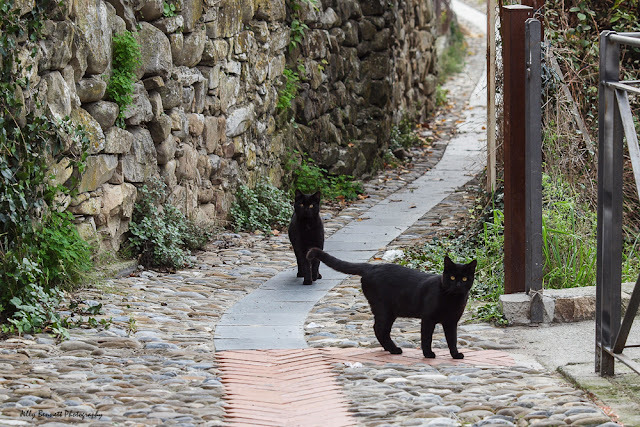 I'd say that anytime you run into black cats while strolling a village in the south of France, it surely indicates good luck.